At this point no one really knows what the future holds for Top Gear, and it seems Clarkson, Hammond, and May have moved on to other projects and will not return. For you Jalops living in the UK, here is your chance to own the Hamster’s E36 M3 that he pushed to the limits of fuel economy across Germany. According to Classic Car Auctions, this 1996 M3 was used in Top Gear Series 15 Episode 2 and was featured in a fuel economy challenge where the hosts had to get across Germany in various sport sedans without running out of fuel. In the episode both Hammond and the Stig put the car through its paces. 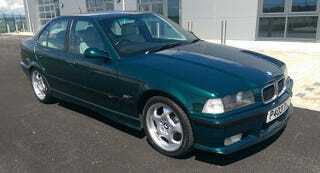 The M3 has 79,235 miles and is estimated to sell between £7,500 - £10,500 (aprox. $12,000 - $16,000 USD). Sixteen grand is a lot of quid to throw down on a nineteen year old BMW, especially since Top Gear challenges are not known to be gentle on cars. Maybe some of the Stig’s mojo will rub off on the next buyer and make them the greatest driver in the world!